Among the wedding flowers rose - permanentsultana, the favorite of brides from different eras and countries, the undisputed symbol of love. This flower is so beautiful and harmonious, it is easy to support any themed wedding, even the most creative and unformatted. Wedding cake with roses never lose its relevance. 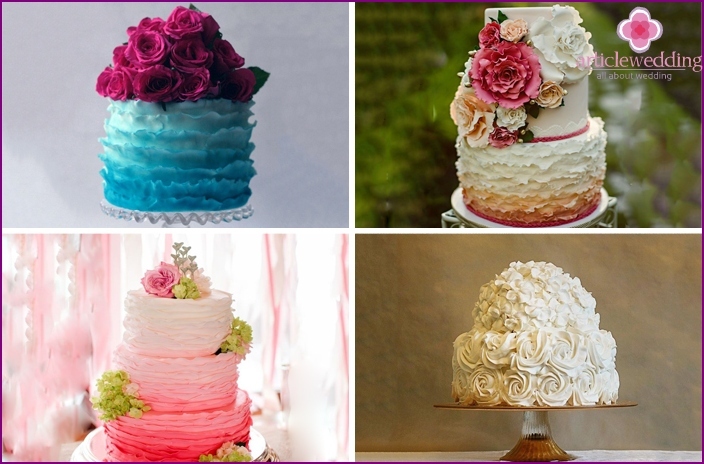 If you are in doubt, what cake to give preference to, feel free to choose a dessert with such colors. What variations are possible decor? What are the latest trends in design such a treat? 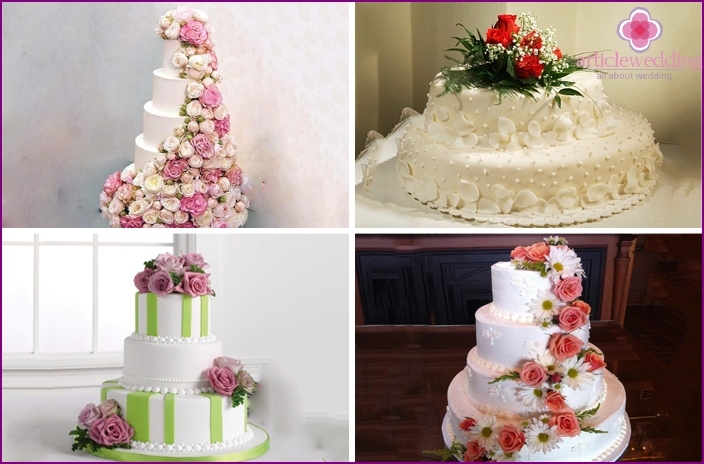 the method and time of delivery (many cakes requiretemperature conditions; this parameter delivery is also important if you plan to use fresh flowers - decorate their dessert must be a couple of hours to feed guests). Cream or whipped cream. Allow to make a continuous embossed pattern in the form of roses or some flowers. Mastic (sugar, milk, chocolate or marshmallow), marzipan, marmalade, meringue (meringue), and chocolate. Suitable for solid colors or bulk applications. The starch wafers (tinted with food coloring). Used for volume or flat colors or individual elements (petals, leaves). Glazes, icing (sugar-protein mass). Applied to painting cakes or ornaments. Cocoa, sugar powder, confectionery sprinkling. With these ingredients perform drawings on a cliche. Prints made food dyes on rice paper. Belt polyethylene food with a pattern for decoration of the side walls of cakes. Live or candied flowers and petals. All these decorations, but the last two, are edible. Each has its own characteristics (such as the conditions of manufacture and storage capabilities of design and color solutions, the presence of the master and, if necessary, time of delivery from other cities). Choosing the way of decoration of the wedding feast, ask the pastry chef, who can offer the best way to implement your plan. 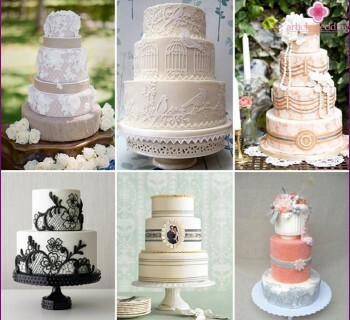 Consider the most current design ideas cake with roses for a wedding. 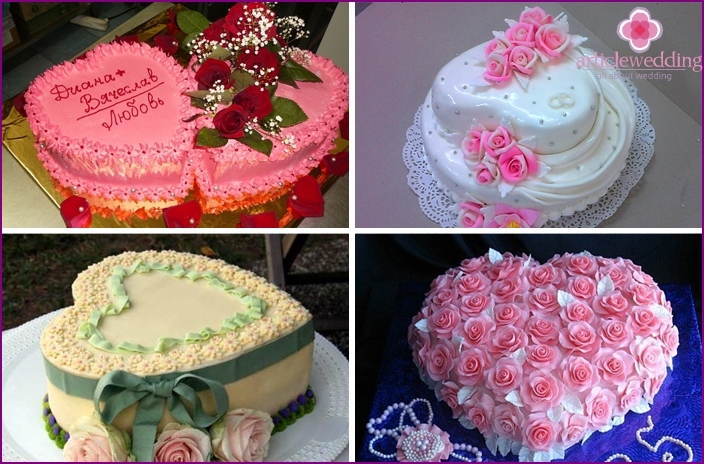 What could be more romantic sweet heart,decorated with white, pink or red roses? This variant design of the wedding feast as popular as the classic cake round. The small heart is suitable for a wedding in a narrow range for a few people. If you want a big cake, you can order a bay, where one, several or all of the cakes will be in the form of heart. Another alternative design of large dessert - single storey in the form of two hearts (separate or connected). Now mastic - the most ideal material forholiday decor. With its help create a realistic buds, and the most fantastic variations of roses and other flowers. Independently prepare mastic mass optional, modern pastry shops offer this product in a wide variety at an affordable price. Jewelry replicas of real rose petals, buds and leaves are made using special forms (MDL). Mastic has the advantage in the choice of colorsolutions - there is virtually no restrictions. 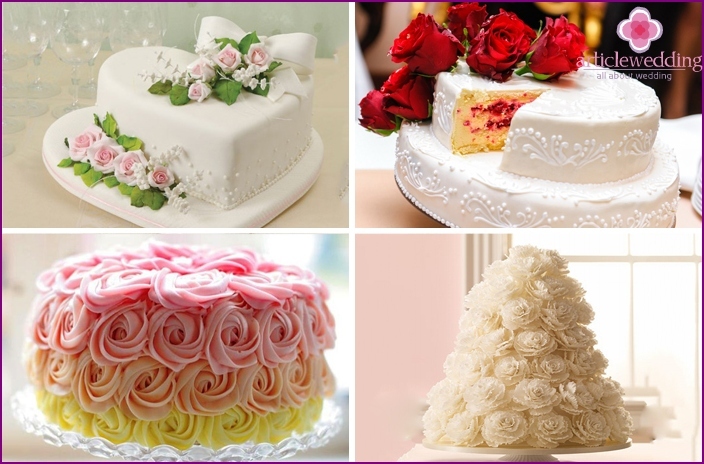 To determine the shade of roses on the cake, use a themed wedding palette or symbolic meaning of colors (white - purity, innocence, pink - tenderness, red - passion, etc.). The taste buds are like mastic, not all (because of excessive sweetness and dryness), but if the sugar paste (starch or gelatin) to replace the chocolate, you can be sure this decor, guests will eat first. Flower stage - it is a bright, spectacular decorationwedding cake. He is placer when buds are scattered as if in a spiral (attached to the cakes one by one) or dense (a drop down tail is entirely on one wire and removed all at once). Although roses cascade of harmonious and self-sufficient by itself, interweaving different colors it will not spoil. With roses combined very many plants. Impressive looks flower cascade of contrasting colors (eg, red and white, yellow and black). Making cakes with fresh flowers - it's freshtrend, bright, juicy and very appropriate for a wedding theme. Delicate rose with a perfect shape of the petals and buds are suitable for such decor could not be better. 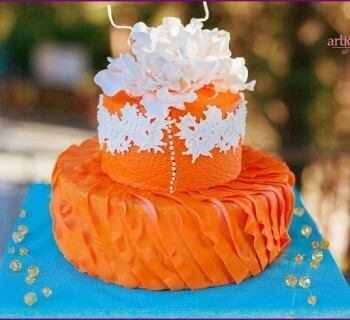 The cake can be decorated with a single flower or a whole bunch. Roses harmonize well with other types of flowers - this property is used in the decor. Fresh buds and petals are good for concise cakes in a minimalist style, and for thematic desserts with a variety of ornaments. In cooking, it is desirable to use environmentallynet (without pesticides) rose. Find these in flower shops is almost impossible, all the flowers are treated with toxic substances. Therefore insert buds into the cake should be wrapped in cling film special cones with cold water. This arrangement isolates the product from the stem and the colors will not fade over several hours (up to days when fresh buds). 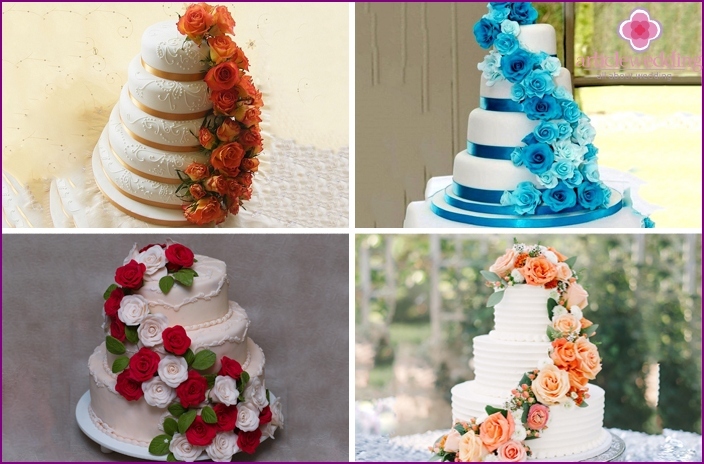 If you want to decorate the wedding cake petals, it is advisable to look for home (chalet) roses that nothing processed. Fashionable already that season staining techniqueOmbre is perfect for continuous relief cream coating in the form of roses. Running decoration with pastry syringe / bag packed with "Rose", so it is the power of even a beginner webmaster. The difficulty is only in getting a smooth color transition. This relatively simple, but very delicate coating does not require additional decoration - wedding cake in any case, get a gentle and romantic. This plot is ideal for custom weddingnewlyweds, who wish to bring a modicum of extravagance in celebration. To make a classical version of the cake with a basket in white. For those who are not afraid to break with tradition, fit more authentic dark (wood) basket with a bunch of roses. Optionally do the whole wedding cake in the form of a basket. 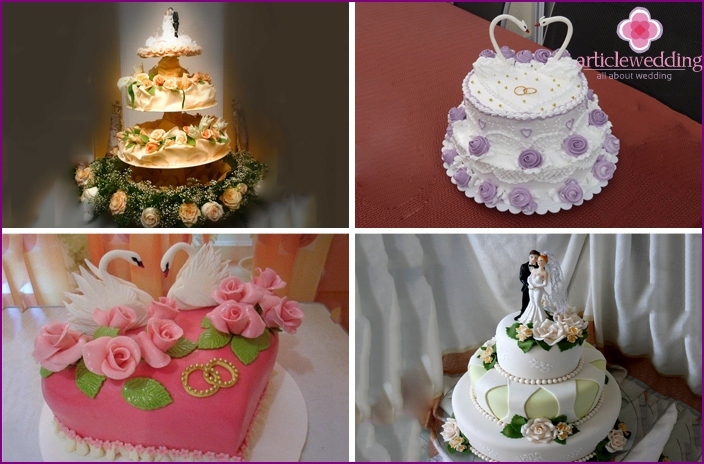 The tiered design of the product is possible in this fashion only one cake, and for the rest choose another design or they remain smooth. Themed Wedding attributes (birds, ring,groom figurines of the bride) go perfectly with roses. Such a tandem repeatedly emphasize the goal celebrations, give pathos or humor (depending on the stylistic design of these small sculptures). As a material for figurines ideal sealant. Porcelain, glass or metal images are used less frequently, but their advantage is durability (if the couple plan to keep figures on the long memory). While roses are considered classics, and many finda conservative floral decorations, this flower is still able to surprise. Moving away from templates and showing little imagination, you can get the original and even eccentric wedding cake. 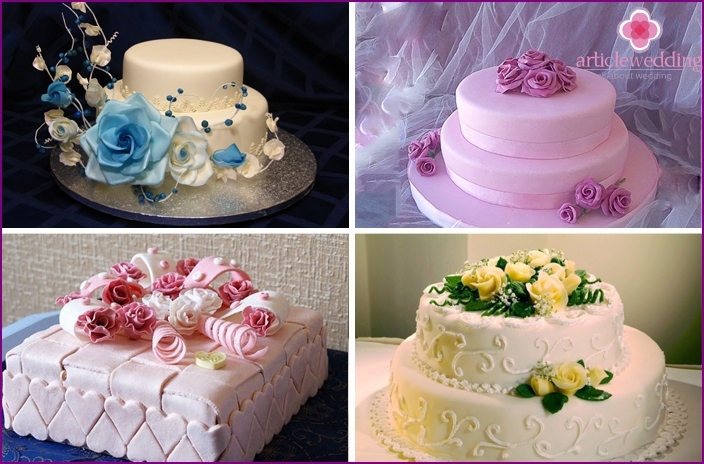 The easiest way to escape from mediocrity - use cakes unusual or irregular in shape, make dark topcoat, or select custom colors for the decoration of the rose (blue, purple, green or black). Do not be afraid to combine incongruous decor onfirst glance details: roses with succulents or wild flowers, snowflakes, notes, funny wedding figurines. 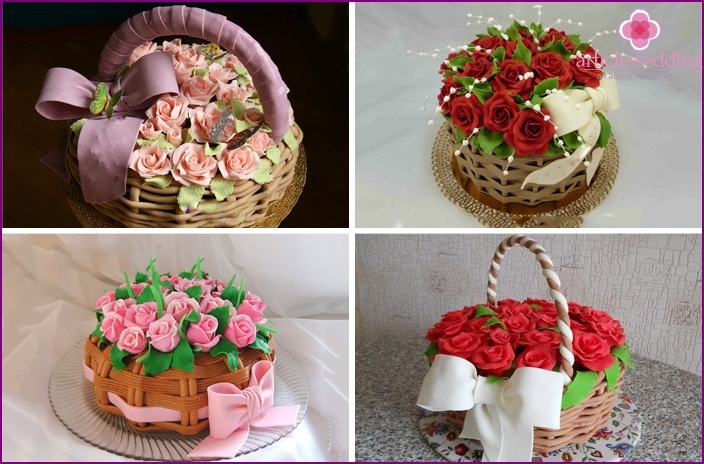 The number of buds on the cake is also not limited: even a single flower will attract attention just because of its beauty and great armful be luxurious decoration. 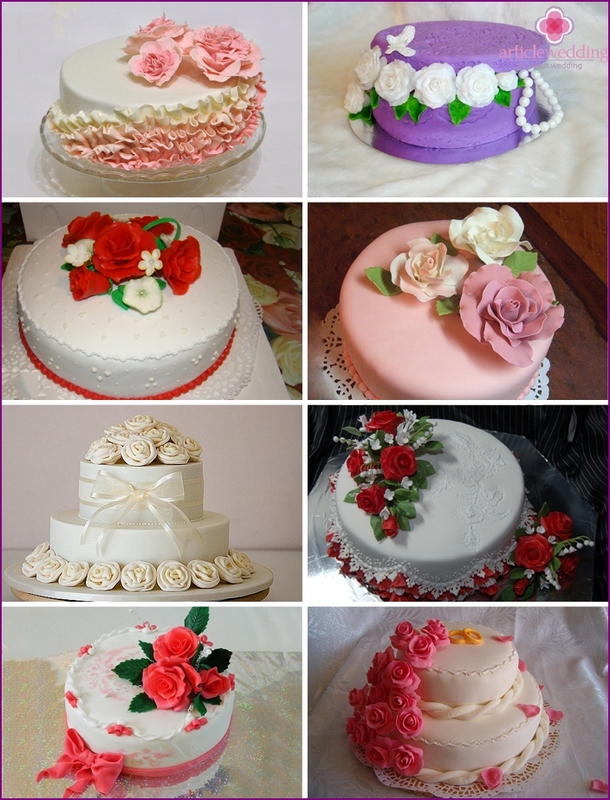 Look at photos of different cakes with roses for a wedding in the gallery below.